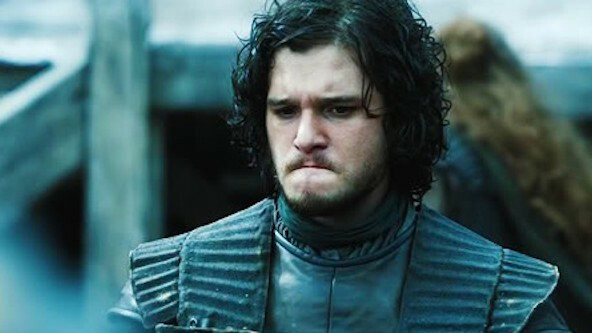 In the category of ‘fan topics that won’t die,’ there has surely never been an example with the apparent longevity and ubiquitous nature of the fate of Jon Snow in the television drama Game Of Thrones. Played by actor Kit Harington, Jon Snow has been one of the series central characters – carrying much of the hopes of fellow characters – and fans – on his fur-draped shoulders. But, as season five drew to a close, it seemed that Jon Snow’s days were heavily numbered – as he was left to slowly bleed to death, after a brutal attack at the hands of his own men. The season five finale aired on June 14th, 2015, and in the intervening months, Kit Harington has been repeatedly cornered by press, and has actually told the world, several times, that Jon Snow is dead. But – whether it is undying devotion, or a genuine reluctance to accept finality – fans of the show have continued to conjure up versions of events in which Snow survives, and returns for the sixth season. Now, Harington – who has since moved on to film projects, such as The Death And Life Of John F. Donovan and Brimstone – has laid bare his truth on The Jonathan Ross Show, and it doesn’t come much clearer than this. The most dedicated fans point to the strangeness of the idea of having an actor of Harington’s stature and calibre on hand for a month or more to do nothing more than play a role that could just as easily be filled by a lifelike dummy. Game Of Thrones is no stranger to prosthetics, after all. Harington, it seems, has little time for conspiracy theories, though. Wherever you fall on the Jon Snow Fate Spectrum, the fact remains that there can be only one truth – and it will be revealed when Game of Thrones season six arrives on April 24th, 2016.